Les Taylor joined Watford from Oxford United in 1980, was player of the season during the season the Hornets were promoted to the First Division and captained Watford in the 1984 FA Cup Final. 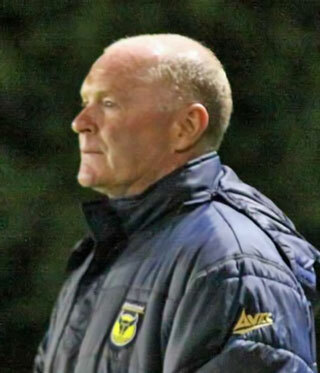 He was also the first person I interviewed for Enjoy the Game, partly because I knew he was working for Oxford United as part of the youth development set-up and so I knew it would be a relatively easy trip to make at a stage when I wasn’t certain the book would go ahead. So in January 2009, I headed to the Kassam Stadium and sat down to talk to Les in what was a rather nondescript meeting room in a concrete corridor beneath one of the stands. How did you come to join Watford? I’d been at Oxford since I was an apprentice and I got into the team very early, at 17. I think I was their youngest captain, at 20. So by the age of 20, 21, I was playing well, fairly consistently, in the Third Division. I’d heard rumours on the grapevine that clubs were watching me but funnily enough not one of them was Watford. Two weeks before Watford came in, Arthur Cox, who was the manager of Chesterfield, had made a bid for me. The club didn’t even tell me about it at the time because it was not a high bid and I only found out about it later. Then I had a phone call at home from our [Oxford United] manager Bill Asprey to say Watford were interested. Straight away I looked in the paper to see where they were. They were sixth from bottom, but a division higher, so it was a progressive step but I have to be honest, I didn’t know anything about the history of the club. Did you do any reading about the club’s history? I didn’t have to. I went to see Graham Taylor and he sold me the club. By the time he’d finished I could have gone on Mastermind, specialist subject Watford FC. You have to remember we didn’t get paid a fortune then so for me moving up a division meant more money so that was a factor. Graham had this rule about living within a certain distance of the ground and that was not a problem for me. I had no hesitation in signing. Do you remember your first game? It was against Luton Town on a Tuesday night in November . I was on the bench but I didn’t mind that because I’d just joined. It was a packed house. I think David Moss scored and it was 1-0 to Luton. Graham brought me on at half-time and played me wide-right, which is where I played for Oxford. I didn’t have any pace but I was a clever player. I can remember Malcolm Poskett got to the byline and absolutely hammered the ball across the face of goal. I was right on the line – nobody there – no goalkeeper – but because the ball came across so quick, it went between my legs. I could have equalised and been the hero. The next game was at home to Blackburn and I played in central midfield and I just couldn’t get in the game. It was all going past me, whether it was the pace of it I don’t know, but I felt like a passenger in that one. Then we had a League Cup tie [against Coventry, which went to a replay] and he [Graham Taylor] said he wanted to play his cup side in the league games either side. Whether I was cup-tied or not I don’t know, I possibly was, but he left me out for a few weeks and it had an adverse effect on me because it took me a while to get settled. Did that knock your confidence then? Stepping up a division and being left out pretty much straight away. It probably did but Graham told me he had signed me for the next three years not the next three games so I knew he wanted me. He signed Pat Rice [from Arsenal] and Gerry Armstrong [from Tottenham] at the same time so I knew he was trying to do things. I’d played wide-right at Oxford, as I said, but I always wanted to play central midfield and I think Graham signed me to play that position. He said he liked to watch a player at least four or five times, home and away, and he said he’d seen enough of me to know he wanted me. You said you didn’t know the history of Watford but you’d presumably played against them at Oxford? They beat us 4-0 and Ross Jenkins scored three. [It was actually 4-2 and Jenkins scored all four]. They were very direct. If you’ve got a guy who’s 6ft 4 you’d be stupid not to play it to him. It was at their place [Vicarage Road] and they completely overwhelmed us. I knew they were a progressive club and that Graham wanted them to go places. What was it about him? You couldn’t have imagined that joining Watford would take you to the First Division and the FA Cup final? If I am honest, no. I was joining a team that had just got in the Second Division and was struggling a bit. I thought, if I do well at Watford maybe I can get a transfer on. I was moving to better myself and better my chances. It was only after I arrived that I felt the energy about the place and realised that if I could get in the side and stay there I might get to go places. My starting wage at Watford was about £250 a week. You had a win bonus and a crowd bonus for anything over 15,000. Money wasn’t my object but I tell you, when you know you’re getting more money if fans come through the gate, you want to put on a performance. Whether it was Graham being clever or not it made us realise that we were there to perform for the supporters. And within 18 months you’re pushing for promotion. We had a great run. You could see from the mix of the side that we had a team that could win promotion. We knew we would win more than we’d lose. It’s not until now that I really appreciate where Graham was coming from. He could talk for England and there’d be some meetings where we’d be dropping off. He used to have someone sitting in the stand analysing what we were doing in games. Graham would tell you on the Monday how many shots you’d had, how many passes, how many tackles, how many times you lost the ball in your own half. Even though it was time-consuming and it sent you to sleep, he’d put the stats on the board and the next game you’d come in and see it. ‘Oh, I’ve had more shots this week.’ It made each of us aware of the contribution (or not) that we were making to the game. It’s long, hard and boring but it makes players think about what they’re doing. It’s the sort of performance analysis we have now, but with pen and paper rather than computers. Exactly. And you can’t argue with it. You might think you had a good game but if he says, ‘Les, no shots, and you lost the ball six times in your own half,’ you couldn’t say, ‘Hang on boss.’ The numbers were there. He knew that if you got certain things right in a game you would more often than not get results. He thought that if you had ten shots on goal, you’d score one goal, so if you had 20 shots you’d perhaps score twice and that might be enough to win. Mind you, if you had 20 shots you might score eight, as happened once! [Against Sunderland]. How did the transition to central midfield come about? After the Luton game he got me to one side for a one-on-one and said: ‘Well, you’re not really a winger are you?’ He said it in the right tone and in the right way and I was quite pleased because I wanted to play in the middle. People talk about the long ball and assume that Watford bypassed the midfield. We got hammered in the press but there was more to it than that, which people didn’t understand. I was player of the season the year we went up [1981-82] and I wouldn’t have got that if the ball kept going over my head, would I? We did play to our strengths and that was keeping the ball in the opposition’s half. Get the ball, make sure we keep it, get it forward. I was one of these people who could run all day. I wanted to be involved all over the pitch, defending, joining the attack. Graham never put restrictions on me. My job was to win the ball, then pass it on, get it wide if I could. And when we were out of possession, upset the opposition. Tackle, chase. I had boundless energy so it was the perfect game for me. You’re from the north east originally? What was it like coming to Watford? I’m from North Shields, Newcastle is my team and I still have loads of relatives up there. I remember we played Newcastle opening day on year [1981-82] and I had loads of my family there. Nigel [Callaghan] scored a great goal – an unbelievable volley. Honestly, I’m not sure I’ve seen a better one. I keep looking for it online but I don’t think there were any cameras there that day. Reaching the First Division was new for you too. I’d been a pro for 13 years and then I was in the First Division. Yeah, I was an instant success! We went on a pre-season trip to Norway and it was very basic, like a boot camp. You wouldn’t be able to do it these days. Players would go on strike. Graham was a runner. He enjoyed it, so we had to run too. We’d go to Cassiobury Park and do these 10-mile runs, halfway to Hemel and back. I remember when John Barnes first joined us, the gaffer gave him a map. I was always in the first four or five but Barnesy was way out in front and didn’t know where he was going. When he got back to Cassiobury Park he was waiting for me and he said, ‘Les, where are we going?’ I sent him the wrong way so I ended up winning. That trip to Norway I think we must have run 150 miles in a week. It certainly felt like it. We had these friendly games but Graham told us we had to take them seriously because we were representing the club. He got really cross if we played it at pre-season friendly pace. He wanted us to treat them like league games and even though we were knackered having trained all day we hammered some of those sides. I got injured in Norway – I pulled a hamstring which meant I was on the bench for the first game against Everton. I came on as sub. Once you got into the side what did you make of the top flight? I loved it. We took a lot of people by storm. They just weren’t ready for us. I think the media did us a favour because they said we couldn’t play football but with Barnes and Callaghan we could tear teams to pieces. They couldn’t see beyond long-ball football. Everyone will tell you this but it wasn’t kicked aimlessly. It was all directed to the wingers or the target men and if there were knock-downs we’d be on it before the opposition. It did create quite a stir didn’t it? The London press hated it. I think Keith Burkinshaw [the Tottenham manager] called us mad dogs. Kenny [Jackett] and I were up against Glenn Hoddle and Ossie Ardilles. If you let them play they will tear you apart. Hoddle was a fantastic player so we didn’t let him have any time on the ball. Any manager who knows what they’re doing would say the same, stop Hoddle. You popped up with quite an important goal at White Hart Lane. It was probably the only time I disobeyed Graham Taylor. It was 0-0 and we got a throw-in near the Tottenham box. I used to cover the edge of the box but for some reason I ran into the box. As Luther [Blissett] took the throw-in I ran into the box. I could hear Graham shouting, ‘no, Les, no,’ but the ball fell to me and I poked it in. Graham had a bit of a go at me afterwards, saying I should have been keeping an eye out for the counter-attack. I said, ‘Hey, gaffer, leave the football to me!’ Fortunately he laughed at that one. The next day the press were scathing. That never bothered me because we’d won at Tottenham. When did teams adapt to Watford’s style? It had already happened in the Second Division. I remember at Cambridge they packed the midfield and made it hard for us to win the ball and get it forward and it ended 0-0. Teams might have known what we were going to do but stopping it was another matter sometimes. A lot of newly-promoted teams make an immediate impact and then fade but you kept it going and finished second. Why was that? Every player was on the boil that season. It was the best team I ever played in. We had a bit of everything. Pat Rice had great experience. He’d won trophies at Arsenal. His organisational skills were fantastic. It was like having four or five extra players behind you because he was always telling you what you couldn’t see. Graham’s system was successful but there was more to it than that. Perhaps we were a bit naïve, but in a good way. We weren’t frightened of playing Liverpool, Manchester United or Tottenham. Even Gerry Armstrong, who was a bit-part player that season, was a great one to have in the dressing room. He was so confident even when he was on the bench. He was not consistent and you never knew what you were going to get with him – on his day he’d be fantastic, other days he was off his game, but as a team-mate he was so good to have around. I don’t think we thought we could win the league, though. Liverpool were already quite a few points ahead at Christmas and when we went to Anfield we were well beaten. The difference in class was immense. You missed a lot of the first-half of the following season, 1983-84. Why was that? I got injured at Sunderland towards the end of the previous season – I broke my toe – and I missed the Liverpool game on the last day, which we won. Then I got fit and we played Oxford United in a pre-season friendly. I went past Gary Briggs and he done me. Just tackled me hard. It probably was a foul to stop me getting away but I felt something go in my knee. I played on, which was a mistake. If your muscles in your leg are big, like mine were, it can mask an injury. I thought it was a knock I could run off. I could play through the pain and just get on with it. I played the first couple of games of the season but I knew it wasn’t right. Ian Rush had the same cartilage operation but he had keyhole surgery because Liverpool’s medical budget was that much bigger than ours. I had mine opened right up. He was out for six weeks, I was out for six months. That was the injury that cost me, really. I was never quite the same player after it. I was only 27 but I lost something – a bit of mobility and endurance. I tried to come back in the November [playing against Sunderland and Manchester United] but it was too soon. I played against Sparta Prague because I’d missed all the UEFA Cup games, and I really appreciated that, but it was a little bit bittersweet. I wanted to be involved in games like that but not when I was only 75 per cent fit. You got back in the side just in time for the FA Cup run though? We got Brighton in the fifth round and although they were the division below us they’d been to the FA Cup final the previous season and still had quite a lot of the same players, so beating them was a good result. In the sixth round we played Birmingham City at St Andrews and we heard in the days before the game that they were expecting a big crowd. It was 40,000 and as English crowds go it was pretty hostile. We didn’t get to the ground until half an hour before the start because we got stuck in traffic so we didn’t have time to think about the game. We got changed and went straight out. We’d stopped for a pre-match meal at a hotel close to the ground and left in good time but a 20-minute journey turned into 45. We had to send someone ahead on foot, one of the coaches, I think, with the teamsheet so we got it in on time. Graham gave his team talk on the bus. Les: This is me. FA Cup quarter-final. Oxford colleague: What? With the hair? Must be a few years ago! Les: I’m surprised it’s in colour! Les: Not a bad hit. Oxford colleague: Not at all! Les: I tell these kids I could play a little bit but they never believe me! The semi-final was against Plymouth Argyle, who were in the Third Division. It must have been strange to be the favourites? It was an emotional day. It was my first semi-final. It was a first semi-final for almost all the lads. It’s one of the only games I’ve ever had cramp and I think that was because of the nerves surrounding the build-up and the whole day. At half-time I was slapping my legs because they just didn’t feel right. After 50 minutes I was really struggling. It was hurting me to run and we had this side that just wouldn’t give up and there’s still 40 minutes to go. I was thinking, ‘What is happening here?’ I could usually run all day but that turned into a very difficult game. Plymouth were unlucky and we were fortunate. Apart from George Reilly’s goal we didn’t have too many chances and I was so relieved when the final whistle went. Did it help you with the build-up and hype before the final? I think all the media coverage before the final is different. You know you’re going to be playing in a cup final, whereas a semi-final you’re worrying you might not get through. Because Wilf [Rostron] had got sent off [in the league at Luton Town] and was suspended, I knew I was going to be captain. Of course, it was an honour for me to be captain but I also knew losing Wilf was going to affect us. It was a dodgy sending off, but we missed Wilf’s experience at the back. We had to bring in a young lad [Neil Price] who struggled. We were one of the youngest teams to ever play in a cup final. I think on the day, we just hoped the front four would work [Callaghan, Barnes, Reilly and Maurice Johnston] but they didn’t really get in the game. We didn’t really get them in the game either. The best chances fell to me. I had a chance that whistled past the post, then I had one that clipped [Everton defender, John] Bailey and went past the post and we didn’t even get a corner for it. I think I knew it wasn’t going to be our day after that. Sometimes I close my eyes and one of those shots goes in and we win the game, but, ah… never mind. I remember wondering whether I’d ever get a chance to go up them stairs at Wembley and lift a cup again and of course I never did. Having said that, I remember before the game thinking to myself, if we win should I let Wilf go up and lift the cup? I think because he was suspended they wouldn’t have allowed that anyway. So would I have got Elton to lift it, or Graham? I don’t know what I’d have done. I was captain by default really and if Wilf had been in the side he would have been captain. There was talk of Pat Rice coming in at left-back and I think they were trying to get him fit because we were short of experience. Steve Sherwood had been a pro a long time but he was a very, very quiet guy. He was a goalkeeper and I don’t think Graham would have had a keeper as captain. Steve Sims was out so it had to be me really. The day itself was all a bit surreal. The TV cameras filmed us having breakfast and the thing they did back then was they’d get a comedy act in. It sounds daft now but that’s what they did. We had Michael Barrymore and Everton had Freddie Starr. It was stupid really. We shouldn’t have done it but I don’t think it was Watford’s choice. To be fair, he just wasn’t funny. I am sure that in hindsight Graham would have wanted to keep everything as normal as possible but these things were imposed on us by the broadcasters. Part of cup final day then was all the build-up so could you even say no? I’ll not forget it, though, that’s for sure. The coach trip up Wembley Way and all the supporters – ours in yellow and red, Everton’s in blue and white. I remember going out on the pitch very early, before the fans were in, and it felt quite small. But later when it was full it felt enormous. I was so focussed on the game I forgot to take the pennant out so when you see a photograph of me shaking hands with the Everton captain, Kevin Ratcliffe, I’ve got no Watford pennant to give him because I’d left it in the dressing room. It was so, so disappointing to lose, although I felt I played well personally. I was happy to have performed, in a selfish way, but a cup final is about the result. It goes without saying I’d have been happier to win. After the game we went back to the Hilton hotel in Watford for a few drinks and then to a party Elton had arranged at John Reid’s house. [John Reid was Elton’s manager and a Watford director at the time]. There was this big marquee up but it felt strange to be having a party having lost. The next day we had an open-top bus tour and I was stunned so many fans turned up. The whole town plus everyone for 10 miles around must have been there. A couple of days later we had a light training session, just to loosen up and be together before breaking up for the summer and Graham had a word with me in front of the team. ‘Someone called Les Taylor signed for two bottles of Champagne at the Hilton hotel,’ he said. It wasn’t me, it was someone claiming to be me, and it wasn’t my signature so goodness knows who paid in the end. Did it take long to get over the disappointment of the cup final? I think some suffered more than others. The second goal wasn’t Steve Sherwood’s fault – it was a foul in my opinion, but then again Steve is 6ft4 and there’s no way someone should bully him. If anything it should be the other way round. I felt for Steve because he was replaced not long after [by Tony Coton]. I think we all found it hard to lift ourselves the following season. I was in and out of the team. He’d drop me for a few and then bring me back. I could see in his eyes he was thinking of replacing me. A couple of clubs came in for me. Derby County was one, but they had dropped down to the Third Division. Arthur Cox was there manager so I knew he liked me and they were throwing money at it. In hindsight it was a bad one to turn down because they got a couple of promotions in quick succession. Wolves came in for me and I went to see them but they were really run down at the time and had no money. I think Graham thought I’d gone over the top a bit. He was also bringing in players of a different level. Tony [Coton] was one – best goalkeeper never to play for England – John McClelland was a fantastic signing. In the end, he signed Brian Talbot from Arsenal. I know Brian quite well. He was manager at Oxford United for a while. He was a good player but he couldn’t play the way Graham wanted him to. He wasn’t the same sort of player as me. Brian wanted more touches on the ball. He slowed the play down. He had a lot of quality but it wasn’t the right fit. I’m biased, of course! Graham stuck with Brian because he’d signed him and Graham could be stubborn. I think the fans wanted me back and he did bring me in for a League Cup game against QPR. The first half things were going well but then they scored and it went downhill. That made it easy for Graham to leave me out again. I could see the writing on the wall. Graham pulled me aside and said he thought the operation had slowed me down and in hindsight he was probably right but at the time it hurt to hear that. I wasn’t the quickest anyway but I couldn’t afford to lose the pace I had. Eventually you left on loan. I went to Reading [in October 1986] and really enjoyed it. Then I came back to Watford and it was like everything had changed. Graham made it clear I wasn’t wanted and that’s the worst feeling in football. I’d never experienced it before and I didn’t handle it very well. I was not an easy person to be around. I was in the reserves and I took it hard. It’s a form of rejection. I was mouthy to the players. I was never mouthy to the staff, I don’t think, but I was not the easiest at that time. We had a bit of a social do, all the players and the coaching staff, and had a few drinks and one of the coaches asked the players if they wanted to say anything. I stood up and started abusing them. I was lashing out because I wasn’t in the team. I can’t remember what it was specifically but it was all emotional stuff – how the club had changed, wasn’t the same as it had been, how the young players didn’t appreciate it because they’d come in to a side that was established in the First Division. It was purely because I was out of the team and hurting. I never said anything in public, I did it behind closed doors. I was hoping another club in the top division would come in for me but the only offers were Derby, Wolves and Reading. I had to pick one of those because I had a family to support. I picked Reading because they were the closest and it meant I wouldn’t have to move. It was less money but it was the closest so it was the best overall. The day I left I went to thank Graham and all the staff for everything they’d done for me. That was the best time of my career and I knew it wasn’t going to be repeated. Yes, I said a few things but I’d never had to handle being in the reserves for a full season before. I think they understood that. I was never anything but honest and that was my honesty coming out in emotional circumstances. Really, I hated having to leave Watford because the success we’d had was unbelievable. You had another day at Wembley with Reading – having said you wouldn’t go back. It wasn’t the FA Cup final, though. It was the Simod Cup final [a knock-out competition for teams in the First and Second Divisions]. We thrashed Luton 4-1 at Wembley. I wasn’t captain but I did get to experience winning at Wembley. I think a few Watford supporters might have come along to give us a cheer that day. Neil Smillie, who was with us at Watford, played for Reading that day and we had another lad from Watford, Paul Franklin, in the squad so there were a few links. The Reading manager was Ian Branfoot, who played for Graham at Lincoln and was very good friends with him, I gather. So I went back to Wembley and won. When the end comes as a footballer it can be hard to accept. I went to Colchester at 33. They actually paid a fee for me, and gave me two years as a player and another couple as a coach. As soon as I got there I knew it was a bad move. I wasn’t mobile so I wasn’t enjoying it. Even now, on their fans’ website, I’m voted their worst ever player! In the end I asked them to cancel my contract. I didn’t ask for any money, I just left. I couldn’t carry on picking up a wage from them. It wasn’t how I wanted to end but I had a great career. Apart from not playing for my country, I achieved what I wanted to achieve. I played at Wembley, played at all the top grounds, and I played in a team that people will always remember. After that I went to Baldock Town, non-league, where Ian Allinson, the old Arsenal player, was the manager. I played one game but I couldn’t run. It took me four days to recover, so I decided that was it. I ended up getting a job at the local hospital in Oxford, the John Radcliffe. I was in the operating theatres working as a porter, picking up the instruments, getting them cleaned and sterilised and packing them up ready to be used again. If you weren’t busy you could go into the gallery where the students could watch the operations from behind a glass panel and I used to love that. It fascinated me and having been operated on a few times I got to see what it was all about. Then I met someone who was an Oxford United fan and one conversation led to another and I was asked to do a bit of coaching. I worked for their centre of excellence and then spent 14 years as youth development manager. What memories do you still have of your time at Watford? The sense of community. All the work we did off the pitch, meeting people, connecting with the fans. That was all new to me at the time. They had a deal with the brewery Benskins and if Watford won anyone in the Benskins club got a free pint. So we took in turns to go round the pubs one night each week. We’d not be drinking, we’d just pop in and meet supporters and have a chat. There was a player of the month award sponsored by Bernard Matthews, the turkey guy? I won it one December and won 24 frozen turkeys. What was I going to do with 24 turkeys? So I donated them to a couple of old people’s homes. All these old dears were snogging me to say thank you! What about your relationship with Graham Taylor? I think more of him now than when I left. There were things I said that could have marred our relationship but they didn’t because he was above all that. Best manager I ever worked with, hands down. He helped me more than anyone else to think about my own game. He was very disciplined and I liked that. No one stepped out of line, whoever they were, and if they did they soon got back into line. We trained like we played so in training you’d have to wear your shin pads because the tackling was full-on. We had so much talent. Nigel Callaghan should have played for England but he loved all the wrong food. John Barnes was not only talented. Even when he had a quiet game he could win you the match with one bit of skill. Wilf was a lovely man, a little guy but a big-hearted player and a big-hearted man. Pat Rice, I have never seen a leader like him. I left Watford and I knew they’d carry on being successful for as long as Graham was there. I thought maybe someone else would lead them out in a cup final and actually win it. Maybe someone will one day.